Compared to grains like brown rice and corn, quinoa (pronounced "keen-wa") doesn't appear much in gluten-free products. Quinoa originated in the Andean region of South America and was known as the "mother of all grains" by the ancient Incans. Perhaps the unlikeliest of foods in which to find quinoa is a veggie burger. One only has to look as far as the frozen sections of local stores to discover organic vegan burgers from Asherah's Gourmet. The Doylestown company blends protein-packed quinoa with such vegetables as potatoes, carrots, peppers and onions to make its burgers. 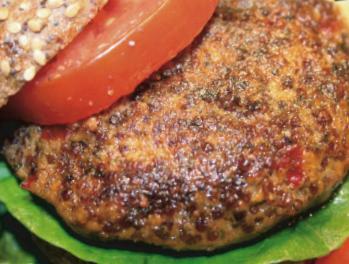 The quarter-pound patties are free of gluten, soy, dairy and nuts. 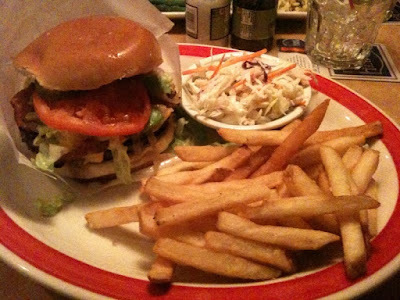 One burger has just 180 calories and 5 grams of fiber. You can order an Asherah's burger on a gluten-free bun at Basically Burgers in Doylestown. Four-burger packages are sold at all local Whole Foods Markets and many local natural-foods stores in the Delaware Valley. The burgers also can be ordered from the company online or by calling 215-489-9815. I've just returned from Clearwater, Florida, where I saw some Phillies Spring Training action for the first time in person. While the weather was hit-and-miss, people certainly are stoked for the start of baseball season. Though Mets fans continue to envy the Phillies' recent success, they can boast of one advantage: access to a new, completely gluten-free concession stand at Citi Field in New York. While I was away, I posted an item about a celiac-awareness benefit dinner in Philadelphia at Sauté scheduled for this Sunday night. I've added two other Philadelphia restaurants to the restaurant list this week. Just-opened 500 Degrees (1504 Sansom Street, 215-568-5000), from the owners of Rouge, offers gluten-free burgers (sans bun), fries and shakes made with Bassett's ice cream. Thanks to the tipster who mentioned that Percy Street Barbeque (900 South Street, 215-625-8510) has lots of menu items for celiacs and those with gluten intolerance. Chef Erin O'Shea says that all of the meats and sandwich fillings, including the brisket and sausage, are gluten free - just order without the bread or roll. In addition, the deviled eggs, avocado salad, "Percy" chopped salad and root beer chili appetizers are made without gluten. Safe sides are pinto beans, coleslaw, German potato salad, collard greens and black-eyed pea salad, and a root beer float is available for dessert. The chef added that the kitchen keeps separate spoon drops for each item that is being prepared to avoid cross-contamination. The restaurant recently garnered a solid two-bell review from Craig LaBan, food critic at the Philadelphia Inquirer. A "to-order" gluten-free bakery new to the South Jersey area is Medford's Tesori's Gluten Free Treats (732-337-9690). There's free local delivery for orders over $35. I'll have more on the bakery in a future post. The website for another gluten-free bakery, My Gluten Free Baker in West Chester, has been dark of late. I haven't been able to reach the owner by e-mail or phone. If anyone has information on the company, please drop me a line. 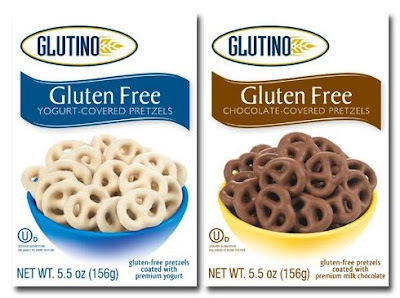 More new products from Glutino are on the way. The company debuted chocolate-covered and yogurt-covered pretzels and vanilla and chocolate donuts at the recent Natural Products West food show. The products should hit stores in May. R.W. Garcia has extended its gluten-free MixtBag tortilla chip line to include a Red & Yellow mix. Made from all natural, non-GMO stone-ground corn, the Red & Yellow MixtBag offers stone-ground yellow corn tortilla chips mixed with red beet tortilla chips. MixtBag tortilla chips are available locally at ShopRite. For those of you going to tonight's Sixers game, enjoy the gluten-free festivities. Have a great weekend! Join the National Foundation for Celiac Awareness on Sunday, March 28 as Philadelphia's Sauté restaurant (775 South Front Street, 215-271-9300) hosts a Celiac Awareness Dinner. Executive Chef Nicholas J. Cassidy has created an adult menu ($45) and a children's menu ($15) for this event based on Saute's contemporary American cuisine. The three-course dinner menus have been prepared with special emphasis on seasonal ingredients and local produce. A portion of the proceeds will be donated to the NFCA to support raising awareness of celiac disease. Reservations are suggested and can be made by calling the restaurant or booking online at OpenTable. With Spring arriving tomorrow, it's nice that something else is in the air other than rain or snow. This week, I wrote about the new marshmallow-flavored Peeps Italian ice available at all Rita's locations beginning tomorrow through April 4. All customers tomorrow get a free regular-size ice of their choice. Maoz Vegetarian's falafel will soon be entirely gluten free. The company is adjusting the recipe to exclude flour and will prepare the falafel in a dedicated fryer. Maoz has two Philadelphia locations (248 South Street, 215-625-3500 and 1115 Walnut Street, 215-922-3409), with others in New York City, central New Jersey, Washington, D.C. and Florida. Shout out goes to Beth. Like many University of Delaware alums, I have fond memories of eating at Klondike Kate's Restaurant & Saloon in Newark (158 East Main Street, 302-737-6100). The casual American eatery now has gluten-free options that include ribs, stuffed shrimp and grilled boneless wings. Thanks to Eva of the Gluten Free Delaware support group for this info. Bellevue Tavern in Cape May Court House, which has been on the gluten-free-friendly restaurant list, has posted its gluten-free menu at its website. Seasons 52 Fresh Grill at the Cherry Hill Mall (and soon to be at the King of Prussia Mall) introduced its Spring 2010 gluten-free menu this week. Regional pizza chain Seasons Pizza plans to expand the number of stores carrying its gluten-free pizza, although the locations have not yet been determined. Thanks to Karin for the tip. Rudi’s Organic Bakery announced this week that it would launch Rudi’s Gluten Free Bakery. The new line will include an original sandwich bread, multigrain bread and cinnamon raisin bread, and will be available nationally starting on July 1. Food for Life's new gluten-free English muffins, in brown rice and multiseed varieties, are available now. I spotted them at Whole Foods in Marlton. Glutino introduced new "New York style" multigrain bagels, made with corn starch, brown rice flour, rolled oats and flaxseed meal. Those too are available at the Marlton Whole Foods. The end of March brings a couple of celiac awareness events to Philadelphia. The 76ers' Celiac Awareness night is Friday, March 26, with discounted tickets available at the team website using code CELIAC. In addition to having gluten-free fare at the concession stand behind section 122, the Sixers will provide gluten-free food at a special location at the Wachovia Center - in the "Gluten-Free Zone" near Section 113. The food includes pasta bowls, grilled chicken sandwiches, hot dogs, assorted candy, soft drinks, beer and hard cider. APO Bar+Lounge (102 South 13th Street, 215-735-7500) is hosting a "Cupcakes & Cocktails" celiac awareness fundraiser on Wednesday, March 31 from 7 p.m. to 11 p.m. Complimentary gluten-free cupcakes and cookies will be provided by Pamela's Products and local bakeries Sweet Freedom Bakery, Virago Baking Company and A Cupcake Wonderland. All proceeds from a $5 cocktail special will be donated directly to the National Foundation for Celiac Awareness. A suggested donation of $5 can be made at the door. To register or for more information, e-mail Lauren Shapiro. 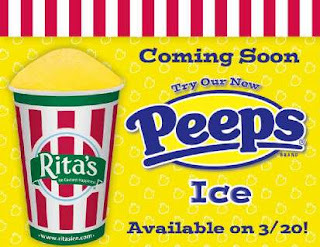 Peeps Marshmallow Candies is partnering with Rita’s to introduce Peeps Ice. The new flavor, which is gluten free, will be available from March 20 until April 4 at all Rita’s locations. For the 18th year running, Rita’s will celebrate the first day of Spring by giving away a free, regular size Italian ice (or, as we say around here, water ice) on March 20 to each guest in the available flavor of his or her choice. All of Rita's Italian Ices, and many Cream Ices, are gluten free. On March 27, the first 500 guests to visit a Rita’s location will receive a free Peeps Chocolate Covered Marshmallow Chick. The gluten-free Chocolate Covered Marshmallow Chicks, in milk and dark chocolate varieties, made their debut last month and are available through Easter. 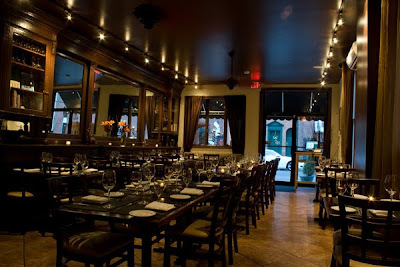 Thanks to everyone who turned out at Casona in Collingswood last night for a special gluten-free dinner. I hope those of you who attended enjoyed it as much as we did. If you have suggestions for a future get-together - perhaps in Pennsylvania next time out - drop me a line. On Tuesday, I mentioned that the National Foundation for Celiac Awareness has announced this year's Celiac Awareness night at the Phillies. It will be held on July 7, with discounted tickets available. I've learned that Woodchuck Cider will be available for the first time at all home games, and it's possible that additional gluten-free items will be coming this season. Super Suppers in Voorhees (910 Haddonfield Berlin Road, 856-784-4550) now offers ready-made gluten-free entrees and sides, including Chicken Satay, Mojo Marinated Flank Steak and Tomato & Zucchini Polenta Bake. The store will be hosting a tasting event on April 8 from 6 p.m. to 8 p.m. Call the store to reserve a spot or sign up online ($10 charge). Thanks go to reader Ramona for this info. Redbridge beer is available at The Pour House in Westmont (124 Haddon Avenue, 856-869-4600). Miel Patisserie in Philadelphia (204 South 17th Street, 215-731-9191) makes macaroons and flourless cakes that have no gluten-containing ingredients. Note that these items are not made in an area separate from the bakery's other products. Hat tip to reader Gina. From the Department of Bad News: Natural Goodness, the natural-foods store at 20th & Market in Philadelphia that carried a number of gluten-free items, has closed. Philly's Sweetie's Pie Diner, which offered several gluten-free dinner pies in its menu rotation, closes on Sunday, according to Meal Ticket. There are a few weeks left in the ski season, so you can still get up to Shawnee Mountain in the Poconos and grab some gluten-free food there. The resort carries hot dog buns, hamburger rolls and sandwich bread from The Grainless Baker. The all-beef hot dogs and hamburgers and the grilled chicken can be cooked using separate pans and utensils. A dedicated french-fryer is located in the Hope Lodge Cafeteria. Also gluten free are tossed salads, puddings, cheese nachos, popcorn, hot chocolate and cereal bars. A shout-out goes to reader Winnie for sending me this information. After launching Seafood Bites appetizers in 2009, Blue Horizon has introduced two more gluten-free fish products. The company's Crab Cakes are made with Atlantic blue claw crab, while the Fish Sticks are made with Alaskan pollock. This week I tried Paskesz's Chocolate Pinstripe cookies, which are a gluten-free version of Keebler's Fudge Stripe cookies, and was impressed. If you can't find them in the Passover section of your local market, you can order them online at Amazon.com. Buffalo Nickel Wingers potato snacks are now available at the Christmas Tree Shops. The Sinking Spring/Reading, Pennsylvania chapter of R.O.C.K. will hold its next meeting on Saturday, March 20 from 2 p.m. to 4 p.m. at the West Lawn United Methodist Church, located at 15 Woodside Avenue in West Lawn. Parents and children are welcome. Samples from Gillian's Foods and Dad's Gluten-Free Pizza Crust will be available. On a personal note, Monday marks the one-year anniversary of Gluten Free Philly's launch. I want to extend my gratitude to the growing number of blog readers. You have made my endeavor a gratifying one. The National League Champion Philadelphia Phillies will host their third Celiac Awareness Night on Wednesday, July 7 at Citizens Bank Park when the team takes on the Atlanta Braves. Citizens Bank Park will have a special gluten-free concession stand at the “Break“ area on the 200 level, in addition to the gluten-free items available at concession stands located throughout the stadium: hot dogs and Redbridge beer at the South Philadelphia Market behind section 128 and Redbridge beer behind sections 139, 204, 323 and in the Brewerytown stand in Ashburn Alley. This season, Woodchuck hard cider will be available at the portable Brewerytown stand behind section 109. Discounted seats for the 7:05 p.m. game are available in Sections 206-207 at $33 each and in Sections 307-310 at $26 per ticket, plus a $6 per-order handling fee. To get the special Celiac Awareness Night discount, be certain to enter promotion code CELIAC when ordering through the Phillies website. Net proceeds from ticket sales purchased with this code go to support raising celiac awareness. Tickets also can be purchased by mail using the ticket order form. For group seating or questions about the game, call Stephanie Nieland at 215-463-9878. For other questions, please call Nancy Ginter of the National Foundation for Celiac Awareness at 215-325-1306, extension 101. We're less than a week away from the gluten-free dining event at Casona in Collingswood. At last check, there were 36 reservations made by readers for the evening of Thursday, March 11. There's still room for more, though, so make plans to come out. Our gang will be there for dinner at 6 p.m. The news on more gluten-free baking mixes just keeps on coming. 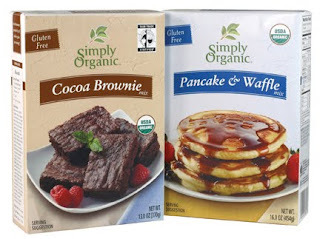 This week I wrote about Simply Organic's new brownie and pancake/waffle mixes. I also posted my roundup of interesting gluten-free Passover products available at local supermarkets. If you subscribe to my blog updates by e-mail and haven't seen the product slideshow I put together, check it out on the website. This week Whole Foods posted a comment to last month's news about the demise of the market's 365 Brand gluten-free baking mixes. According to Whole Foods, it is "transitioning back to the Gluten Free Pantry mixes that were moved out to make room for the 365 versions." Although Ruth's Chris Steak House - with four area locations in King of Prussia, Philadelphia, Princeton and Atlantic City - does not have a gluten-free menu, the restaurant maintains a list of foods to avoid. The off-limits items include the breaded and fried foods, pasta, au gratin sides, stuffed mushrooms, lobster bisque, gumbo, onion soup, crab cakes, calamari, bleu cheese crust, blue cheese dressing, au poivre sauce, Oscar-style condiment, sweet potato casserole, creamed spinach and corn pudding. Berries and cream, ice cream and sorbet are the safe desserts. Seasons 52 Fresh Grill's new location at the King of Prussia Mall opens on March 29. The chain's gluten-free menu changes every three months. Gluten-free bakery Sweet Freedom now offers local delivery in the Philadelphia zip codes: 19103, 19106, 19107, 19102, 19147, 19146, 19123, 19130, and 19104. Delivery costs $12 and the minimum order amount is $20. The Princeton location of Whole Foods Market is sponsoring two gluten-free store tours this month, on March 11 and March 25 at 2:30 p.m. Links to register for the free tours are posted at the store's event's page or call the store at 609-799-2919. The gluten-free wellness talk and tour at the Plymouth Meeting Whole Foods originally planned for February 25 has been rescheduled for April 1 at 6 p.m. Call the store at 610-832-0010 to register or stop by the Customer Service Booth. This month's specials at Amazon.com include savings up to 20 percent off on Erewhon gluten-free cereals: save 5 percent using code USMILLSI at checkout and save an additional 15 percent (with free shipping) when combining with a Subscribe & Save order. You can also save up to 25 percent off on Annie's gluten-free macaroni & cheese, fruit snacks, dressings and condiments: save 10 percent using code ANNIEHM5 at checkout and save an additional 15 percent (with free shipping) when combining with a Subscribe & Save order. Local supermarkets have begun stocking products for Passover, which this year begins the evening of March 29. Observant Jews avoid eating foods made with leavened wheat during the holiday to commemorate their ancestors' escape from slavery in ancient Egypt. (I heart "The Ten Commandments," as cheesy as that movie now appears. When Charlton Heston parts the Red Sea? Classic!) According to the story of Passover, the Hebrews left Egypt in such haste that there was no time to bake leavened bread. Because of this tenet, many Passover foods are made gluten free, usually with potato flour. As a result, the next few weeks bring a plethora of wonderful gluten-free products - such as those pictured in the slide show accompanying this article - to market. Some stores carry only the basics, such as Manischewitz Passover Egg Noodles, while those with Kosher sections tend to have more options. The ShopRite markets on Roosevelt Boulevard in Philadelphia and on Route 70 in Cherry Hill have a large selection of gluten-free items on the shelves. Wegmans stores plan to carry a number of frozen items, including Hoo-Lachmu Passover Flats (great for making pizza and sandwiches), Klein's Viennese Ice Cream Cake, Macabee Passover Pizza, and Meal Mart Frozen Dinners, Chicken Wings and Fun Shapes Chicken Nuggets. At least three different companies - Paskesz, Gefen and Streit's - produced gluten-free chow mein noodles this year, and plenty of gluten-free cereals abound. Osem's pound cake and other loaves are relatively inexpensive and can be found in many markets. Lieber's and Gefen baking mixes are available at stores with larger variety. Many gluten-free items also are available in the Passover section of the Avi Glatt online Kosher supermarket, which is offering customers $20 off an order of $150 or more using code AG20 at checkout. About a week or so before the start of Passover, markets receive their shipments of fresh cakes and cookies from New York bakeries such as Shabtai Gourmet. Look for sandwich and rainbow cookies, petits fours, cake rolls, layer cakes and frosted round cakes, among others. Shabtai's treats will be available locally at Acme, Pathmark, ShopRite and Wegmans. Prices of some Passover foods tend to be higher than their non-holiday counterparts, so I suggest buying one of a particular item to see if you like it before stocking up. Keep an eye on Passover sections in the beginning of April - as the eight-day holiday nears its end - when markets slash the prices of whatever products are left. Ramapo Valley Brewery's gluten-free Passover Honey Lager is not available this Passover, as the company is upgrading its license from a microbrewery to a full-scale brewery and is restricted from shipping its beer until that process is completed. For readers observing Passover, I recommend the certified gluten-free oat matzoh made by New Jersey's Lakewood Matzoh. Last year, we tried the handmade, round version, which comes three to a box. This year, we ordered the machine-made kind, which come nine square pieces per package. Each box is $23, with free shipping when ordering two or more. (The Acme supermarket in Penn Valley plans to carry Lakewood's handmade matzoh.) According to an e-mail I received from the company, the handmade gluten-free matzoh was done before any wheat was introduced to the facility. The machine run was done after a 48-hour break in production of wheat matzoh, with a complete cleaning of any area that came in contact with wheat flour.